As the warms in late spring and summer, there's nothing quite like an outdoor garden party to celebrate Mother's Day, a graduation, or to just give family and friends their day in the sun. 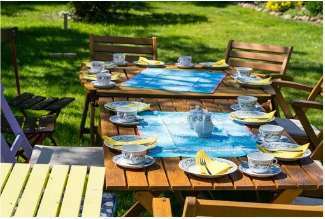 Make it special by sprucing up an otherwise casual backyard garden with real silverware, elegant tablecloths and, of course, oversized flower centerpieces and fruit bowls for splashes of bright, vivid color. Like any good party planner you should expect it to rain, and have an alternative space inside where guests can party indoors. After all, there's nothing like being prepared for the worst to ensure it won't happen! Send out invitations using downloadable clipart or garden photos, then set up any outdoor space decorated with fresh flowers (silk or paper flowers will do if a green thumb isn't one of your strong points,) terra cotta pot utensil holders, or a bright carved watermelon basket you can make yourself. You don't need an enormous lawn with space for furniture. A small patio, city backyard - or any outdoor space with room for chairs and a group of people - can be a perfect garden party setting. Send guests home happy with a keepsake favor flower seed packets, a fresh flower bouquet, or a satchel of home-grown vegetables from your garden. Oprah Hosts the Perfect Garden Party - There she is, holding court in a jazzy garden party hat with additional images in a photo gallery - and including a complete menu, recipes, tips and advice for party decorating, making the invitations, planning the menu and setting the table. You can check out her other ideas for summer parties, too. Evite's Garden Party Guide - Evite provides more than just the email invitations and an easy way to manage the guest list. You'll find ideas for themes and activities as well as menu suggestions complete with recipes. Mint julep, anyone? 10 Spring Garden Party Ideas - Click through the main page to find clever ideas for homemade invitations, decorations, drink and food menu ideas with related illustrations and photos.